A timely collection of research papers by 18 leading scientists in the area of biochemical genetics of diabetes mellitus, these contributions focus on a well defined class of monogenic forms of the disease (i.e. MODYs 1-5) all caused by specific mutations or deletion of genes that control pancreatic beta-cell functions: HNF-4alpha (1), glucokinase (2), HNF-1alpha (3), IDX-1 (4) and HNF-1beta (5). This volume offers a historical perspective of MODYs, and it also contains contributions which deal with the fundamental questions of pancreas and liver development, critical for the understanding of the syndrome complex discussed. Attempts have been made to highlight results and concepts that may be relevant for understanding type-II diabetes in general, exemplified by contributions that connect the field of pancreatic islet cell biology and pathology with the newest findings in the area of insulin action, e.g. the role of the insulin receptor and insulin receptor substrates (IRS 1-3). 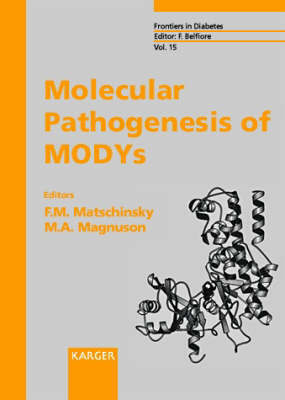 Covering a broad and novel approach on the subject of MODYs, this book looks into the future of molecular genetic and biochemical research in this area. It is recommended reading for basic research scientists in the area of diabetes mellitus, academically oriented endocrinologists and clinical researchers.